For a long time Slimefoot knew nothing except the Weatherlight's warm hull and the hot sun of Bogardan. As it grew out of its sporehood into its stalk phase, it was conscious of sound, the voices of other living things. These voices were sometimes loud and sometimes soft, and gradually it learned to differentiate them into individual life forms. One day two of those individual life forms used ropes to climb down the hull with a tool, a long wooden handle with a blade on the end. "I think we left this one too long," one said. "It's going to be hard to pry off." "Just give it a good whack first," the other said. "That should loosen it." Slimefoot didn't think a whack would be good at all. Then the roar of fire came from the sky and voices shouted in alarm. The two life forms dropped their tool and scrambled down their ropes toward the ground. The sound and scent of fire was alarming enough to boost Slimefoot right into the next stage of its development. It popped its partially grown stalks out of their casing and then hesitated. It wasn't developed enough to see for more than a short distance around and it couldn't tell where the fire and shouting was coming from. But this warm hull had been Slimefoot's whole life and it was afraid to leave. Instead, it started the laborious climb upward. Its stalks were weak and undeveloped, and it trembled with the effort of the climb. The waves of heat in the air dried its skin and made it harder and harder to hold on. Nearly limp with exhaustion, it reached the edge of the deck and wiggled under the lowest bar of the railing. The heat had stopped but the voices continued. Slimefoot knew it wasn't safe yet and dragged itself forward across the deck, looking for shelter. Abruptly the deck disappeared under it. It plunged down through dark empty air and landed with a splat. It lay there for a time, dazed by the darkness and the fall, until it realized it could sense a presence. A warm white star, shining from the nest of tubes and metal filling the dark space. It gave Slimefoot the strength to crawl farther, to find a passage to climb through into an empty space, where it could finally rest. Slimefoot grew in darkness, the shining white star supplying all the nourishment of the sun. After a time, it knew its home had lifted up and moved through the air, but it wasn't sure what that meant. As it grew larger and its senses became more keen, it started to hear voices, carried on the tubes that connected the white star at the ship's heart to the rest of its Thran body. "I hope they're all right down there," one voice said. "This Cabal agent has been able to fool an entire academy of mages—that doesn't sound good." The white star surrounded this voice with a warm glow, and Slimefoot was sure it had heard it before, before its stalk phase. This was the voice that had guided the ship's rebirth. Tiana. It was called Tiana. Another voice said, "All the agent had to do was lie low and pretend not to be a bloodthirsty murderer." That was Arvad, who the white star had called from across the world to be Tiana's friend and helper. "Cabal cultists are good at that." "Wait, is that Jhoira's owl? She said she'd send it up when they were done." "That's the owl. I'll go start dinner." Slimefoot knew it was nearing the beginning of its emergent phase when its stalks grew stronger. At some point it would have to venture out, but the outside world had been so frightening. It seemed much more sensible to stay here and go into an early reproduction cycle. At least after that it would have company. Slimefoot went dormant during reproduction to concentrate its energy, but when it became aware again, it was to a sense of heat on the ship's hull. The air was dry as dust. It was definitely more sensible to stay here in the safe dark, watched over by the white star. But it heard voices again. One said, "I like your daughter." That was Jhoira, a voice the ship knew in its Thran bones. The ship recognized Teferi's laugh. "Of course you do. I wish you could have met Subira." "So you don't regret it, then. Giving up your spark?" "I regret a lot of things. But not that." Slimefoot mostly communed with its new sprouts, enjoying the sense of companionship, but it listened to the voices, learning about the other inhabitants of the ship. The scent of Yavimaya drifted down through the openings in the wooden walls. It almost made Slimefoot consider going out for a look. But the sprouts couldn't move yet, and the fresh green scent of Yavimaya was combined with the frightening taint of smoke. Slimefoot huddled down with its sprouts and didn't move. Then a voice said, "The Weatherlight is so much the same, and so different." Karn, the white star whispered. Slimefoot felt the Thran structure hum in response. "Is it strange to be on board again?" That was Shanna, who had patterns in her blood that were the same as those woven through the ship's bones. "After all that happened to you?" A trace of amusement in his resonant voice, Karn answered, "After all that happened to me, everything is strange." Raff was another whose blood was familiar. Slimefoot was wary of the two new ones, Chandra and Jaya, who smelled of fire, though the white star didn't seem to mind them. Jhoira said, "Jodah told me about you. Does he know you're back?" Jaya said, "Huh. I didn't know he was back." "He's in Tolaria West, at the Academy. Once all this is over, we can take you back there. If you want." "Thanks for the offer. But I'm not sure just how back I am yet, if you know what I mean." The other two aboard weren't known to the ship, but the white star did not object to their presence. Not even the one who had death written into her skin. Liliana said, "You didn't tell Chandra about Josu." Gideon told her, "No, and I won't. It's not my story to tell, is it." "If you told her, you might have used it to make her feel . . . make her feel she should help us kill Belzenlok." Gideon sounded exasperated. But Gideon sounded exasperated a lot, so Slimefoot wasn't sure it meant anything. "Liliana . . . If that's what you want, why didn't you tell her?" "I don't need to, do I? She already wants to help us kill Belzenlok." "Because she agrees with us that it has to be done before we face Nicol Bolas again. I don't even know what you're asking me. Are you trying to find out why my first impulse isn't to use information given to me in strict confidence by one friend to manipulate another friend?" "No, of course not!" Liliana strode away. Slimefoot heard Gideon murmur, "Her capacity to lie to herself is almost infinite." Slimefoot began to seriously consider whether it should leave its safe haven. The sprouts had reached their incipient stalk phase and Slimefoot had sent the chemical signal telling them it was time to complete their transition. They uprooted their stalks and practiced walking around the chamber and climbing its walls. Slimefoot needed to use its own stalks before it slid back into a dormant phase. It was considering the problem when the door opened. A figure stood there. It had been a long time since Slimefoot had seen another living being and it was more curious than startled. After a long moment, the figure said, "Tiana, I think I found where that smell is coming from." It was Arvad! Slimefoot freed an armstalk from the bulk of its body and waved. "The storage space next to the main engine compartment," Arvad added. Slimefoot and Arvad stared at each other until Tiana appeared. "Oh, holy Serra," Tiana said. Slimefoot waved at her. "Did it just wave at me?" Tiana said. "I think so." Arvad hesitated. "If you can understand me, wave at both of us." Slimefoot freed a second armstalk and waved at both of them. "Huh." Tiana seemed nonplussed. "Right, then." "I think it's a thallid," Arvad said. "Probably." Tiana was quiet for a moment. "Hey, are you a thallid?" Slimefoot didn't have the vocal apparatus to reply, but used its armstalks to gesture. It wasn't entirely sure what it was yet, though it felt that knowledge would come with a later phase of development. It was hard to convey that with gestures. "It's obviously trying to answer you," Arvad said. "I wouldn't say obviously," Tiana said. "Because it doesn't have a face?" Arvad asked. Tiana seemed to be trying to turn her head sideways to look at Slimefoot from another angle. "Well, yes, but it is talking to us, so it's definitely . . . Hold on, Raff might be able to talk to it." Tiana left. Slimefoot and Arvad stared at each other some more. Arvad said, "Hello. I'm Arvad. Sometimes called the Cursed." Slimefoot gestured assent and pointed at the slime curtain around its stalks, trying to convey its own name. Then Tiana appeared with Raff. Raff said, "Oh, right, this is a thallid. Hi there, thallid." Slimefoot freed a third armstalk to wave a greeting. "That's helpful, Raff," Tiana said. Her tone suggested that it was not at all helpful. "What is it doing here?" "Well, thallids are from Yavimaya, and are sort of related to mushrooms," Raff explained. "They were originally created as a . . . Uh, I'll tell you later. It's a little awkward to get into all that with it standing there. This one probably came aboard as a spore, stuck to that tree elemental seed Jhoira used to regrow the hull. Oh, hey, and it's had like ten babies already." Slimefoot looked around at its sprouts, all in the stalk phase now. It prompted them, and they all waved at their new friends. "Yeah, those are little thallids. Hi, little thallids," Raff said. He turned to Tiana. "What are you going to do about it?" Tiana didn't answer, but sighed deeply. Slimefoot wasn't sure how to interpret that. Arvad said, "It—they haven't shown any sign of trying to attack us or hurt the ship . . . Do we need to do anything about it?" "We could take it to Yavimaya," Raff suggested. "We were just at Yavimaya." Tiana put both hands in the auburn growth on her head, like she might pull it out. "Right, let's just leave it where it is right now. I'm going to talk to Jhoira." Arvad closed the door, and Slimefoot heard them walking away. Voice fading with distance, Raff said, "Tell Jhoira that Serra said it was okay that it's here—Ow! I was kidding!" Slimefoot considered its situation, then looked around at its sprouts. Instinctively, it knew that it was time to move around and look at the world. Well, it had better get started. Slimefoot sent the chemical signals to its sprouts to tell them it was time to leave their home. Once they were all thumping around on the floor, Slimefoot went to the door. Pushing it open, Slimefoot stepped out, calling the sprouts to come along. It followed the path Tiana and Arvad had taken. They had gone down a large curving corridor, and Slimefoot realized it must run along the inside of the ship's hull. It went through the first opening and found Tiana and Arvad standing in a chamber in the center part of the ship, which had openings to other corridors. Arvad said, "It's followed us. With the babies." "I see that." Tiana stared at Slimefoot and Slimefoot stared back. 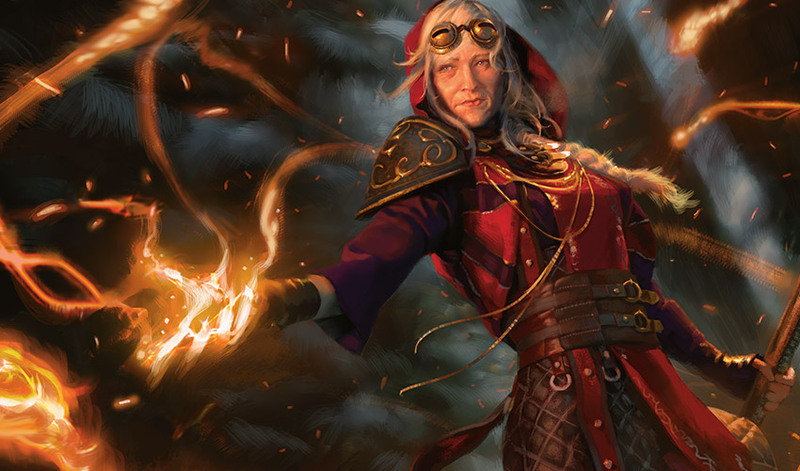 Liliana strode in, stopped, and demanded, "What's this?" "They're thallids, from Yavimaya, probably," Tiana said. Arvad spoke to Slimefoot: "Thallids, this is Liliana." Slimefoot waved a greeting at her, and prompted all the sprouts to do the same. 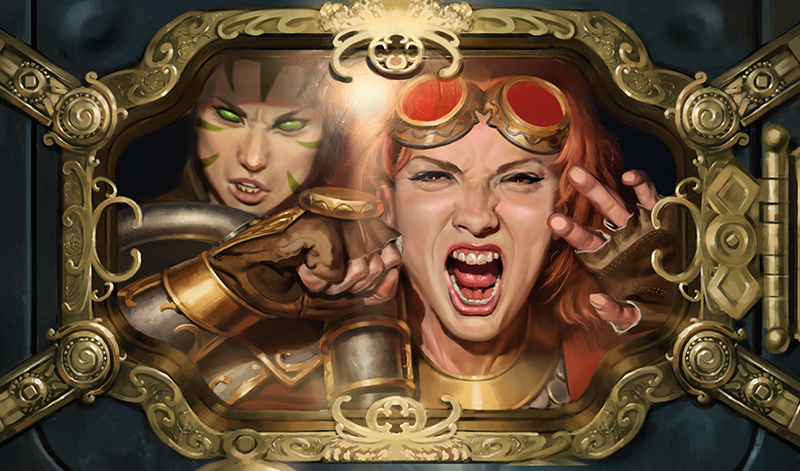 Tiana added, "Apparently they've been aboard since the ship was constructed in—"
Liliana frowned at Slimefoot. "Yes, whatever. What do they do?" Tiana eyed Slimefoot. "So far, they stare at people." "Well, that's useless." Liliana turned to Arvad and said, "How did you decide not to eat people?" Arvad could eat people? That was alarming. Slimefoot and all its sprouts turned to stare at Arvad. Arvad seemed taken aback as well. "It wasn't a decision. I didn't want to be a vampire. I was turned against my will." Liliana waved a hand. "Yes, I understand that, but once you were turned, wouldn't drinking blood be the natural thing to do?" "No." Arvad appeared confused. "Are you trying to convince me that drinking blood is a good idea?" "No, of course not." Liliana appeared to reconsider. "Unless it's expedient, then—"
Tiana had folded her arms, watching with a speculative expression. Now she said, "You're asking him how he resisted the urge to be selfish." Liliana turned to glare at her. "No, I'm not asking that." She glanced at Arvad again. "But since she's brought it up, how did you?" Arvad's expression turned thoughtful. "It wasn't easy. I had to hold on to an image of myself as I was before I was changed. As I wanted to be." He added, "With the Powerstone's effect on me, it's much easier. But I know I could leave its influence if I had to, and retain control." Liliana didn't look as if that was what she wanted to hear. "So there's no trick to it." Tiana scratched her head and asked, "Is there something you'd like to talk about? I am an angel. We're supposed to be good at this sort of thing." "No, of course not." Liliana recoiled in horror. "Never mind. And if you tell anyone we had this conversation, you'll both regret it." She strode away down another corridor. That had been interesting. Slimefoot felt better about its decision to explore. After growing so long in the dark, the outside world was certainly proving to be an interesting place. There was obviously a lot more to see. It chose a different corridor and started away. Behind it, Arvad said, "Uh, we better warn the others that it's here." Tiana said, "I'll go forward, you go aft." Slimefoot explored for a while. The winding paths of the corridors and rounded shapes of the chambers were pleasantly familiar. The people had said the ship had grown from the seed of an elemental, which was probably why it felt so familiar, and why it had sheltered Slimefoot and accelerated its growth and life cycle, why Slimefoot seemed to know and understand so many things about its other inhabitants. It found an opening to a chamber and looked inside. 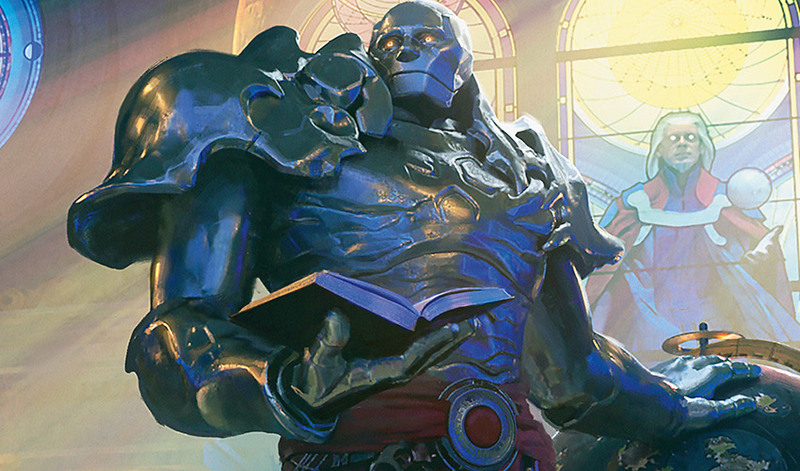 Teferi sat on one side of the room reading a book, and on the other Gideon was sharpening a weapon. Gideon looked up at Slimefoot. Slimefoot waved a greeting. Gideon said, "Teferi." Teferi looked up briefly. "Ah, thallids. Yes, Tiana said they found some living in the engine compartment." Gideon was silent a moment, then said, "That sounds like someone else's problem," and went back to sharpening the blade. Slimefoot watched them for a while, but they didn't do anything else, so it moved on. Next it found a large compartment where Jhoira sat at a table. Jhoira was the ship's favorite. Jhoira had a lens over her right eye to examine the crystal and metal artificer's components spread out on the table. She fumbled for a tool just out of reach and Slimefoot used an extra armstalk to pick it up and hand it to her. She said, "Thank you, Shanna." "That's not me." Shanna came into the room and took a seat across from Jhoira. "And I'll try not to take it personally." "What?" Jhoira looked up, blinking. She focused on Slimefoot. "Oh, sorry. Yes, Tiana said we had stowaways." Raff had followed Shanna in. "Hello, thallids." He sat down and said to Shanna, "I'm just saying, most famous warriors have a tragic past." "I don't," Shanna said, with an air of finality. "I know, I just think it's odd," Raff persisted. Slimefoot thought almost being killed by a shovel and having to use its still-soft stalks to flee for its life up to shelter in the ship's engine compartment might qualify as a tragic past, but everything had gone pretty well after that point. Its sprouts cautiously explored the room, studying the books and tools in all the shelves they could reach. "Please ask them not to touch anything," Jhoira said to Slimefoot. 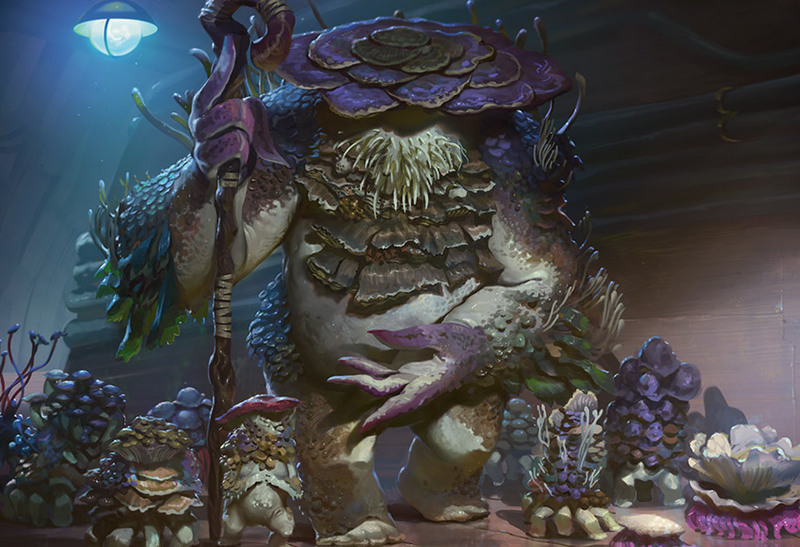 Slimefoot told the sprouts not to get too close to anything, though right now they didn't have armstalks. Raff apparently still wanted to talk about tragic pasts. "No, I mean, are you sure it's not just a little tragic?" Shanna sighed. "There was the time my younger sister burnt the honey bread on Solstice morning because she was flirting with the neighbors, and my older sister told her she'd ruined the holiday. There were tears." Jhoira adjusted her eyepiece. "You know, Raff, you don't have a tragic past either." "That's because he barely has a past," Shanna said. Raff drew himself up. "You don't know my past isn't tragic." Jhoira lifted her brows. He tried, "It's not easy studying at the Tolarian Academy, you know." "She does know," Shanna pointed out. Jhoira propped her chin on her hand, glaring at him through her eyepiece. "And how many time rifts did you get trapped in?" Raff deflated. "I forgot about that." Arvad stopped in the doorway and said, "Oh, they're in here." Jhoira looked up at Slimefoot, who had leaned over to examine the objects on the table. "Yes, they are." Arvad stepped in. "They seem harmless. What do you plan to do with them?" 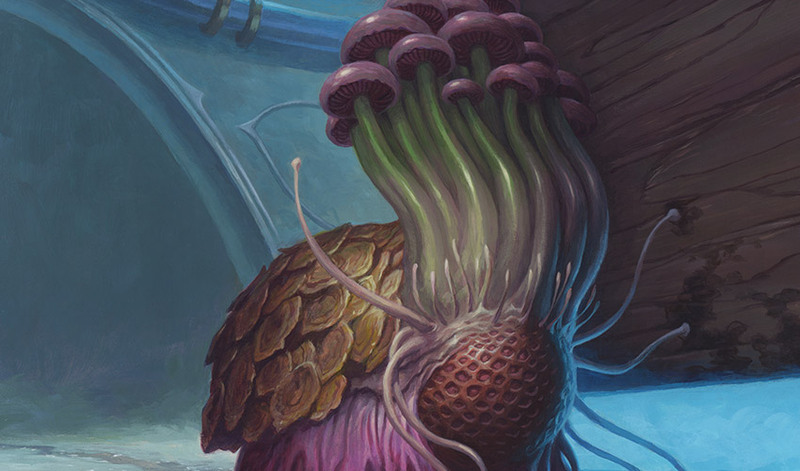 Slimefoot twisted its upper part to regard Jhoira closely. She watched it steadily for a long moment, then smiled. "I must have brought them here with Molimo's seed, so we'll have to take them back to Yavimaya when we have a chance." Slimefoot wasn't sure how to express its appreciation, so it handed her another tool. A muffled roaring sounded from above, then was abruptly cut off. Slimefoot recognized the sound of fire, and ordered its sprouts to cluster close. Raff sat up, startled. "What was that?" "That's Chandra and Jaya, up on the deck." Shanna pointed upward. "Pyromancers throwing fireballs on a wooden skyship?" Raff didn't look happy. "Is that really a good idea?" Slimefoot thought it was a terrible idea. Arvad seemed resigned. "No, not really, but they both say Chandra needs to find her true self, and that seems to involve a lot of fire." "Karn is keeping an eye on them." Jhoira adjusted her eyepiece and picked up another tool. This was curious. Slimefoot ordered its sprouts to stay with Raff, and set off to get more information. As it headed for the door, Raff called out, "Hey, where are you going? You left your babies!" The sprouts had obeyed and were clustered tightly around Raff's chair. "I think you're the babysitter, Raff," Shanna commented. Slimefoot found the stairs up to the deck and climbed into the glare of sunlight. The first thing it saw was that the ship flew over water. Endless water that seemed to stretch in all directions. Slimefoot had been distantly aware that the ship had flown over water before, but seeing it was different. It walked across the deck to the rail, remembering how long that journey had seemed when it was a barely mobile sprout, fleeing for its life. The sun warmed Slimefoot's cap and pores, the heat soaking in. The sky was blue and clouds drifted across it, and in the distance Slimefoot's senses detected land. Someone beside it said, "Hello, thallid. I am Karn." Slimefoot turned and waved a greeting. Karn gestured toward the stern. "Don't approach the pyromancers; they're working and require a great deal of concentration. Also, though they haven't done it since we boarded the ship, they have been known to shout at each other very loudly." Karn leaned closer and lowered his voice. "It is annoying." Slimefoot settled down on the deck, demonstrating that it had no intention of going anywhere near the pyromancers. Karn sat down beside it, and said, "We are on our way to Urborg, to destroy the demon Belzenlok in the Stronghold of the Cabal." Slimefoot watched Karn soberly. It wasn't sure what all of that meant, but it was frightening. Karn continued, "Our success is not guaranteed, but we are a formidable group." He hesitated, then said, "I'm sorry I had to disturb the earth of Yavimaya to retrieve the cylix. I know it was disruptive to every being living in the forest nearby. But I thought it was necessary. I need to take it to New Phyrexia and destroy their plane once and for all. I mean to end them forever." He looked closely at Slimefoot, waiting for a response. Something about the word Phyrexia made the white star at the ship's heart pulse with—anger? Fear? Anticipation? Slimefoot wasn't sure, and its skin twitched with reaction. Karn still waited, and Slimefoot gestured with its armstalks, signaling understanding. Karn nodded, and looked out over the water. "The others think the Phyrexians are no longer a threat, and perhaps they're right." Karn's heavy brow lowered, and Slimefoot thought he seemed both sad and worried. Karn added, "But I feel the sooner I act, the better." Slimefoot stared at Karn, but he said nothing more, so Slimefoot just sat beside him and watched the endless water. Chandra sat on the deck, thirty-seven individual fireballs floating above her head. Keeping them all contained and in motion wasn't easy, but Chandra was managing it. "How am I doing?" she asked. Pacing on the deck behind her, Jaya said, "If you need to ask, you must not be doing very well." Chandra didn't let any of the balls slip. Whatever Jaya thought about her temper, she had too much sense to lose control on a wooden skyship. And there were things she needed to know. "Why did you change your mind about helping me? Is it because of what I did for Multani?" "Partly." Jaya moved around to face her. "It was the first indication I'd ever seen that you were capable of concentrating on something for any length of time." Chandra kept her attention on the fireballs, and not one wobbled. She grinned. "I know what you're doing. You're being mean to test me." Jaya snorted. "I'm being honest to test you, kid." Chandra had the feeling that wasn't a joke. "Was I really that bad?" Jaya sighed and paced away again. "Not so much. I've seen worse. Stubborn, impatient, like talking to stone walls, no idea what they want—"
Chandra didn't remember it that way, though she was willing to admit she had been terrible at listening to Mother Luti. She thought about how she would have felt in Jaya's place. I would probably have gotten into a fight with me and taught myself a painful lesson. It was a little daunting, how much self-control it seemed a powerful pyromancer needed. "Hey, I wasn't that bad. I kind of know what I want. Sort of, sometimes." "You know what you think you want," Jaya corrected. "Just like I did." She paced away. "I thought I wanted my freedom. It took me a long time to realize what I really wanted was to help a bunch of monks guide young pyromancers. Even stubborn ones like you." Chandra grinned. "Is that why you didn't give up on me?" Jaya sighed. "Let's say I don't like unfinished business." She shrugged a little. "You don't know yourself yet, so you don't think things through. The way you helped Multani showed me that you just might have some idea of how to get in touch with your true self." She looked down at Chandra again, her face serious. "If you know what you really want, you don't make mistakes." Chandra let the words sink in, thinking about what she thought she wanted, the mistakes she had made. How she really felt. One of the fireballs on the far end flared a little and Chandra steadied it. "My friend Nissa left us when we first got here. She didn't trust Liliana, and didn't think we should kill Belzenlok, and . . . I know she needed to get back to her own plane, after everything that happened there. But it just felt really . . . "
Jaya watched her. "Like she abandoned you." "Yeah, and I guess that's partly why I got so upset," Chandra admitted. "And yelled at you when I thought you were Mother Luti, and really yelled at you when I found out who you were." Chandra knew it sounded like she was making an excuse. She was done with excuses. "I know that doesn't make how I acted any better. But I'm over it now, and I'm ready to burn Belzenlok and the Cabal right off this plane. That's what I want." Chandra risked a look up at her and saw that Jaya's gaze was on the horizon. A dark smudge marked the blue sky there, like a cloud. Like the ash cloud over a volcano. Chandra's eyes narrowed. They were coming up on Urborg. Jaya glanced down at her and said, "You're going to get your chance to prove that, kid." Slimefoot could smell smoke on the sea wind, and the distant scent of rot and burning. Its skin shivered, and it went back to the stairs and climbed down to find its sprouts. It was time to go back to the safety of the engine compartment and the white star's light. For now.